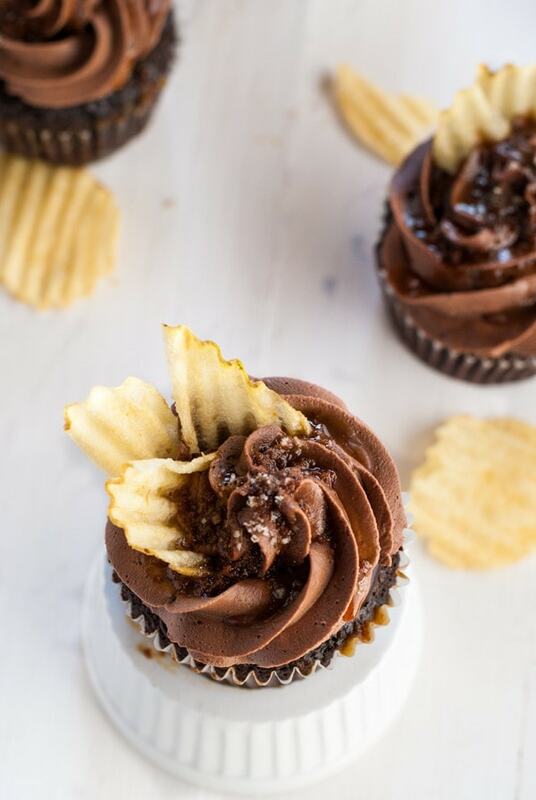 Chocolate cupcakes with coffee glaze, chocolate ganache, and topped with potato chips for that sweet and salty twist we all love! Oh. My. Gosh. Let me tell you about these chocolate cupcakes. These are quite possibly the best cupcakes I’ve ever made. And I’ve had a lot of cupcakes in my time. Seriously, I don’t know why I didn’t make this sooner. I think I need to turn this into a cake one day… soon. It is impossible to have just one cupcake. You really have to eat two of them. You can probably save yourself time by making these in a jumbo muffin tin. That way you can fit more potato chips on top. Oh, by the way, the recipe calls for original ridge potato chips, but you are in for a real experience if you use a salt & vinegar ridge chip. I am sure that weird cappuccino chip would work, too. 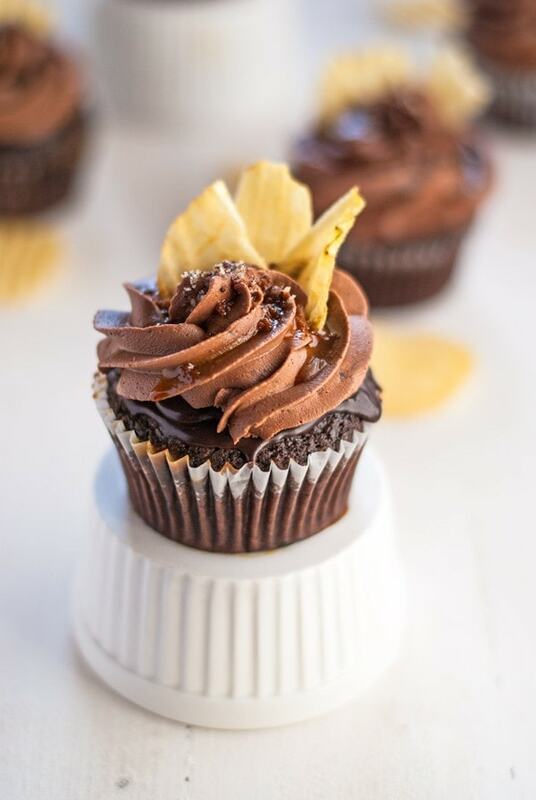 Seriously though, if you like salt & vinegar chips, you might like them in this cupcake. 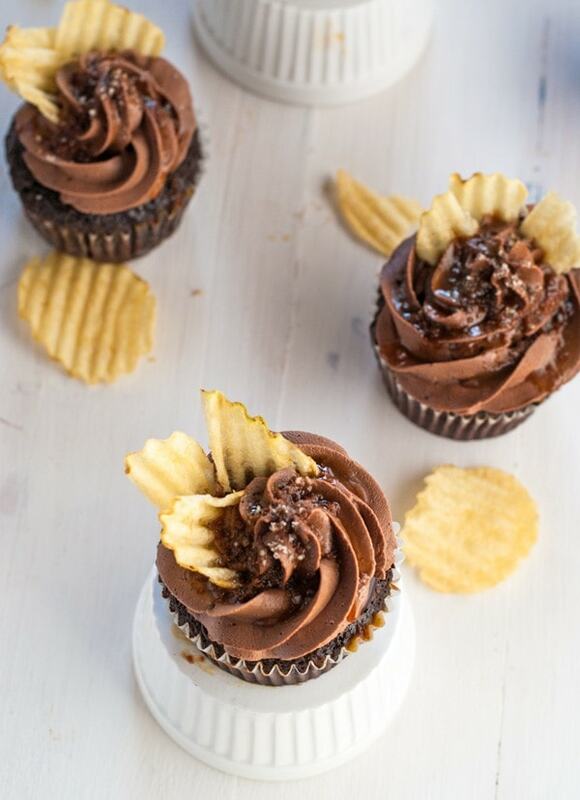 The vinegar really works well with the sweet chocolate of the cupcake. At least I really enjoy it! I also really like to pour on that caramel on top. I tried to hold back for the sake of the photos here, but normally, I like it dripping all down the paper liner onto my hand. Yum. And an extra heaping of vanilla fleur de sel. So good. 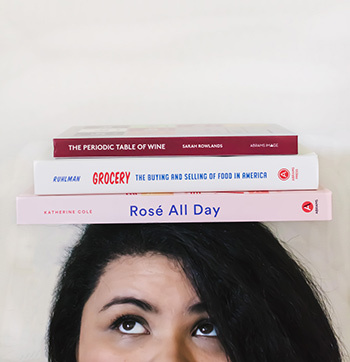 Although there are a lot of different parts to the recipe, it doesn’t take too long to put them together. 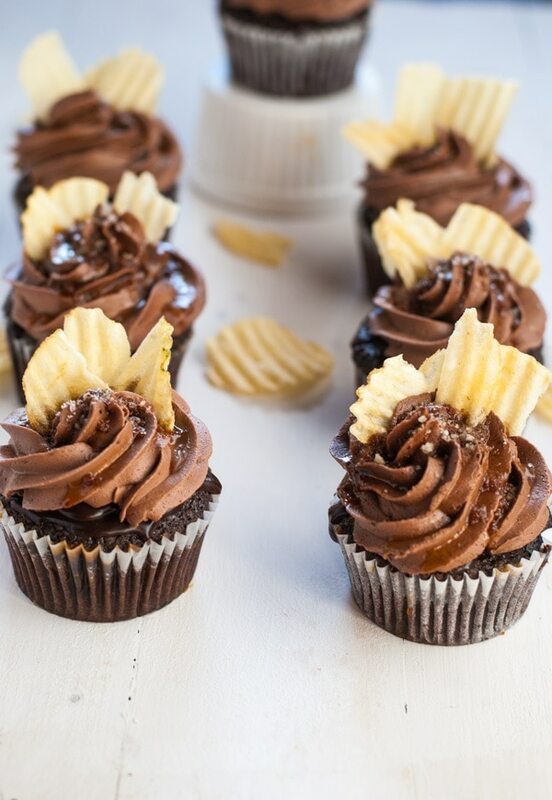 You can easily make a lot of the cupcake accouterments ahead of time such as the syrup and caramel. 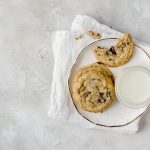 You can also make the buttercream and refrigerate until use and give it an hour to reach room temperature, or leave it out at room temperature in an airtight container overnight. I made the cupcake the night before and did all the rest the next morning. 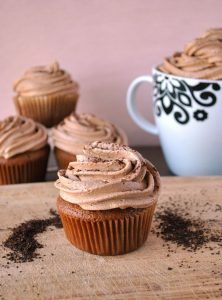 These are the perfect cupcakes to impress your friends and relatives and are well worth the time and effort! *It may seem like a lot of ingredients, but a lot of them repeat! In a medium bowl, add the dark chocolate, cocoa powder and hot coffee together. Mix well until smooth and refrigerate until chilled, at least 30 minutes. Whisk together the flour, sugar, salt, and baking soda together in a large bowl and set aside. Take out the chocolate mixture and whisk in the oil and eggs, then mix into the flour until smooth - one or two small lumps are okay. 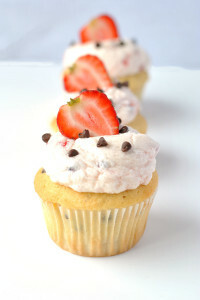 Fill the cupcake liners ¾ full and bake for about 18 - 20 minutes. Make the coffee syrup by heating the coffee and sugar together until boiling for about 5 minutes. Allow to cool while the cupcakes bake. 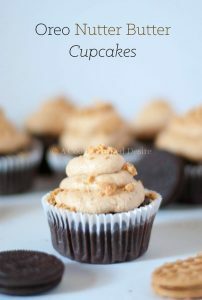 While the cupcakes are still hot, brush the tops with the coffee syrup. (You may have some syrup left over). Allow the cupcakes to cool. Make the ganache by slowly melting the chocolate, then whisking in the heavy cream until fully incorporated. 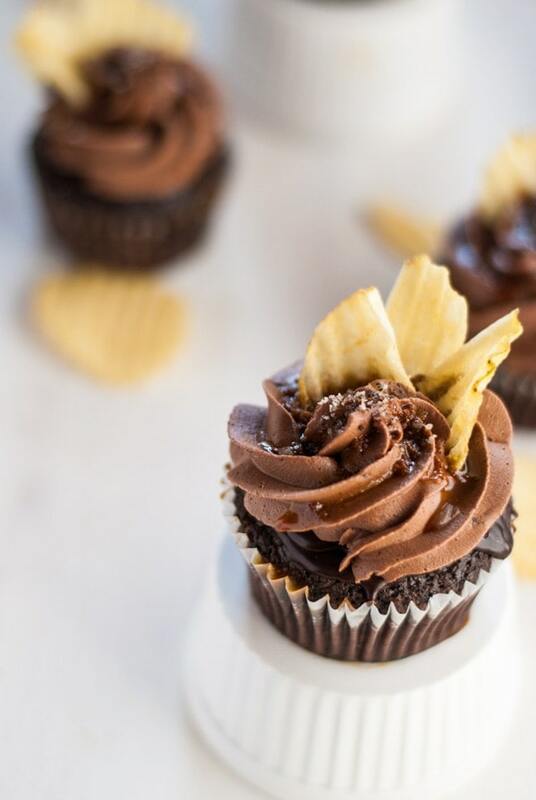 Top the cooled cupcakes with the ganache. Make the buttercream. Beat the butter until light and creamy. Add the espresso and cocoa powder, then the melted chocolate. Slowly add in the powdered sugar and beat until light and fluffy. Add heavy cream if you want added creaminess (I didn't feel it was necessary). Fit a piping bag with a large open star tip (I believe mine is an Ateco #4 or #5) and fill with the buttercream. Top the cupcakes with the frosting. Make the caramel. Heat the sugar in medium-low heat until melted. The sugar should liquefy and turn a deep amber. Quickly take off the heat and add the chilled butter and mix until well incorporated. Add the heavy cream. Note: The mixture will bubble a lot once you add the butter, so be careful. Use a spoon to drizzle the caramel over the buttercream. It should easily swirl down the frosting along the grooves on the frosting. 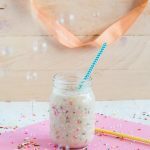 Sprinkle the cupcakes with fleur de sel (I use a vanilla infused fleur de sel from Beanilla). 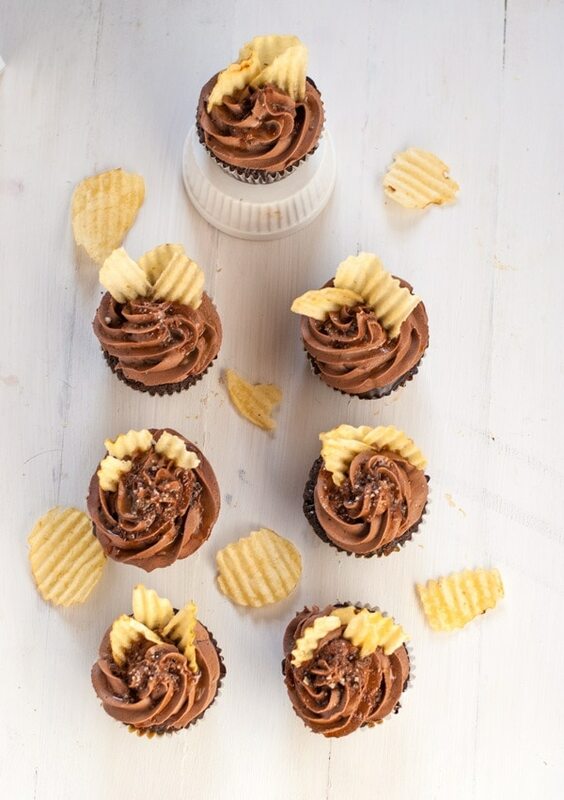 Insert potato chips into the frosting. 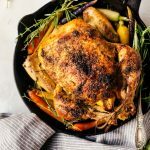 Serve immediately, or store in an air tight container at room temperature for up to three days. If not eating right away, do not garnish with potato chips until ready to serve. 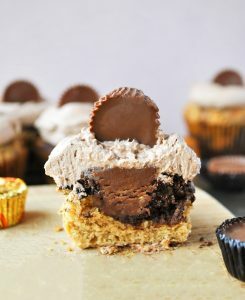 I’m going to go out on a limb and say these probably are the best cupcakes ever. You can tell by the photos that they just look devine. Pinning this for later! Yep, I definitely need to make these. I can’t get enough of the sweet and salty! What a genius salty sweet combo!